An example of a Maltese cross. The definition of a Maltese cross is the symbol for a Christian order known as the Knights Hospitaller that was established in the mid 16th century in Malta by Charles V of Spain. 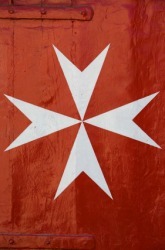 An example of a Maltese cross is a cross with four equal arms that look like four v-shaped arrowheads joined at their points. "Maltese cross." YourDictionary, n.d. Web. 18 April 2019. <https://www.yourdictionary.com/maltese-cross>. A cross having four equal arms resembling arrowheads joined at the points. (gymnastics) A position on the rings where the gymnast's body is horizontal and straight, with arms to the side; a horizontal planche.